For some time now, I haven’t posted regularly to this blog. It is not that I’ve lost interest in it. In fact, I realize that I need it more than ever, but I’ll get back to that later. Anyway, for months, my head has been stuffed with so many complex thoughts that it has been impossible to separate the wheat from the chafe. If I am to be honest, more often than not, my thoughts are not happy, happy thoughts, but those that I like to pretend don’t exist. I mean, who wants to admit that, more often than not, their head bombarded with negative self-talk. Who wants to acknowledge that they are oftentimes overwhelmed with sadness and depressing thoughts that they can’t seem to shake. More importantly, I convinced myself that no one wanted to read about my particular bouts with my own ‘darkness of the soul.’ No, that would certainly fall into the category of t.m.i. (too much information). Granted, this is a personal journey blog. With that said, it touches upon the inevitable thoughts, feelings and challenges that I experience on my journey towards self-discovery, mindfulness, and inner awareness. I created this blog, not to sell or market any product or service. I did not create it with the intention of attracting scores of readers; although I welcome and treasure each person who happens by. I created it as a forum upon which I could be a witness to my thoughts, feelings and impressions, and where I could confront my ego self and come to know my real self. In other words and without the woo-woo words and phrases, I wanted to tell my story, and more importantly, uncover my truths and expose the lies that I tell myself. The thing is that I’ve come to realize is that from the beginning, I’ve censored my story. Except in passing, I choose not to write about fibromyalgia and the way it has a firm grip on me and every facet of my life. I didn’t write about the feelings arising from the loss of a hard-fought for career as an attorney, and the resulting loss of self-esteem. I didn’t write about the effect of constant pain on the body. I didn’t write about my loss of independence, which having grown up poor, was essential to me. I didn’t write about the irony of the yearned for ‘clean slate’ at the very time that my health prevents me from acting upon it. I didn’t write about the grief that etched itself into my being, and I certainly didn’t write about the depression that sometimes overwhelms me and brings with it a blanket of loneliness, darkness and at times, hopelessness. I’ve created a blog that embraces the positive, while denying the more difficult and undesirable truths about myself. 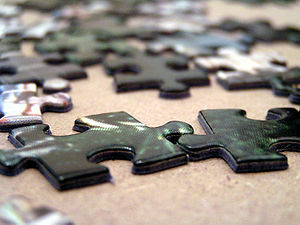 Yet, these missing pieces are, like those of a puzzle, integral to my story, to who I am and to who I am meant to be. Without exploring and integrating them, my story is incomplete and in some cases, prone to inaccurate conclusions. Without experiencing life’s lows, we cannot fully appreciate its’ highs. Similarly, to know and appreciate the light, it is necessary to welcome the darkness. I intend to begin doing just that. I’ve learned that blogging, like journaling, is an invaluable tool that allows me to piece together things about myself that were previously unnoticed. In my case, I writing has always given me the opportunity to be open and honest about my thoughts and feelings, while, at the same time, forcing me to acknowledge and accept them in a new and different way. It is through writing that I’ve uncovered valuable details about, for instance, why I believe and do the things that I do. Granted, I am not turning this blog into a litany of ‘poor me’ posts. Instead, I will strive for balance, and as Rumi writes, I will meet the darkness, depression and other negative thoughts, and invite them in. Yet, I can assure you that I won’t be laughing as they waltz on in. Instead, I will begin with a grudging respect, for they are an undeniable part of who I am. This entry was posted in #story, Uncategorized and tagged #fibromyalgia, blogging, Depression, guesthouse, Health, Mental health, Pain, querencia, Rumi, seekingquerencia, writing. Bookmark the permalink.